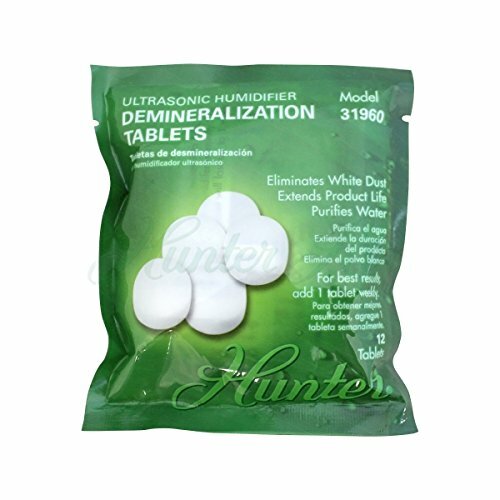 Hunter 31960 demineralization tablets provide a lot of benefit for little effort. They eliminate white dust for easier cleaning, extend the humidifier's life, and purify the water. All by simply dropping one in the tank and running the humidifier normally. White dust is a byproduct of minerals naturally occurring in water that are occasionally released into the air when the humidifier is running. Your demineralization tablet removes the minerals and eliminates white dust buildup on surfaces near the humidifier. For best results, use 1 tablet per week. 12 oem tablets per pack. If you have any questions about this product by Hunter Home Comfort, contact us by completing and submitting the form below. If you are looking for a specif part number, please include it with your message.